Susan G. Komen Greater Atlanta is joining Emory's Glenn Family Breast Center at Winship Cancer Institute to host a breast cancer conference in the Emory Saint Joseph’s Hospital Auditorium from 8:30 a.m.to 1:30 p.m., Oct. 15. 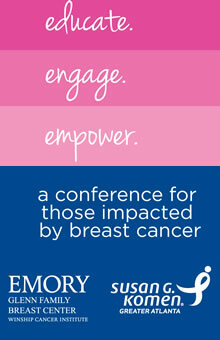 The purpose of the conference is to educate, engage and empower those impacted by breast cancer. The agenda will include a mock tumor board preview so participants can see how a multidisciplinary care team discusses and constructs a personalized treatment plan for every patient. Other topics will include clinical trial advances, screening recommendations and a cooking demo. Continental breakfast and refreshments will be provided.